I’ve been doing my blog long enough now that I have forgotten many of the entries from the past. It has nothing to do with being 69 years old. Honest. While reviewing my stats page I found where someone had followed this link from an older post on my site. Someone put a lot of effort into compiling this information about lights. I felt it worthy of posting again. I don’t know how long it has been since it was updated, but there is a lot of DIY information available. Lights. No, I’m not going to build a bamboo recumbent but I find them very interesting. I’m not sure what started this interest. Probably my morning routine. I normally start each day reading a couple of the forums I frequent, then a few other blogs that I like and then a couple of news sites. From one of these I probably followed a link to a bamboo bike and then a search for bamboo bikes. I’m sure you know the routine. You follow a link of interest that leads to another link of interest and so on. I did a post some months ago about Dug Shelby and his ride across the US on a bamboo bike built by Klaus Volkmann, a musician from Brazil. That tour should prove the worthiness of a bamboo bike. This week I noticed this beautiful bamboo trike built by a fellow Atomic Zombie builder, Here is a thread on Atomic Zombie and here is a build post on Instructables. It’s just loaded with useful information. This is one of most beautiful, useful pieces of transportation I’ve seen. I’ve noticed quite a few new bamboo bikes and trikes being built. I’ve now started myself a page to track them. I’ll be posting new information and builds as I find them. 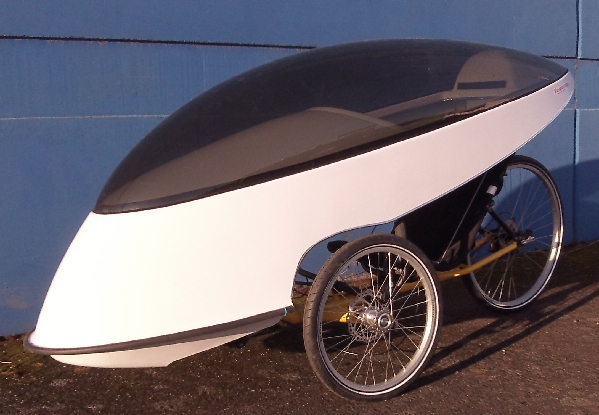 The Plymobile built by Titus van den Brink of the Netherlands is a unique, beautiful velomobile. Titus shared his building information on his blog. Rather than bog you down with detail, Titus has included many pictures of his build so you can see the detail. Included also are some of his experiences with his velomobile in parades and events. You may want to view other wooden velomobiles here. This morning I needed to do repairs to my trike before the weather changed. I had heard on the news that it was going to get colder for a few days. I guess I wasn’t paying attention. I checked the Weather Channel website and got the big picture. 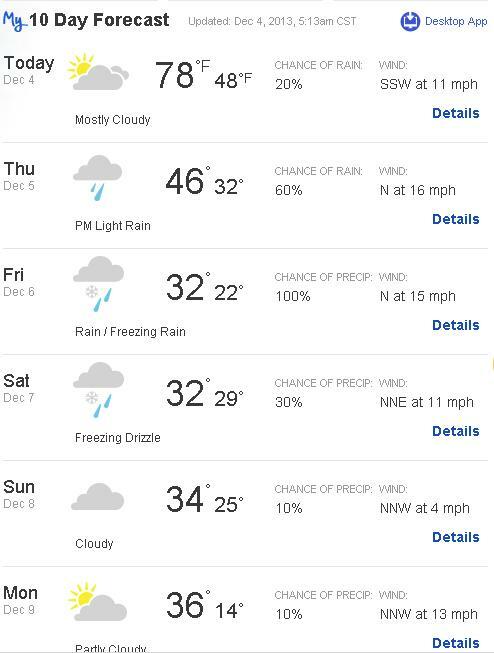 It’s going to get down to 14 degrees in East Texas. Who approved that? The average temperatures in Dallas for the month of December is daytime high 58 degrees and night time low of 39 degrees. As you can see, 14 degrees is somewhat of an oddity for the North Texas climate. Coldest temperature recorded for Dallas was 1 degree back in 1989. I’m a warm weather person. I can ride my bike when it’s 100+ without a problem. But when temperatures drop below 40 my riding times are nil and I watch for warm days to ride. I guess tomorrow might be my last day to ride for the next week or so. I know, I know. (Said with a whinny voice) You live north of the Red River and it gets much colder where your live. That’s the main reason I don’t live north of the Red River. If your new to recumbent riding or just seeking information about the feasibility of you riding a recumbent, Recumbent TV might be your best source. Travis Prebble has gathered an assortment of videos from manufacturers and recumbent riders from around the world. If you have plenty of bandwidth you can spend hours researching what might be right for you or if you just want to spend a short time enjoying others experiences on recumbents then Recumbent TV has made it just a mouse click away. Recumbent TV. The Blue Sky Speeder is a nice looking velomobile shell that will add aerodynamics to your trike and get you out of the cold rain. The Speeder is priced at just $850 plus $200 shipping and I assume that is to the lower 48. You can see the Blue Sky Speeder here on YouTube.